Honeywell Camelback Road Facility (CRF), Camelback Road & Black Canyon Freeway, Phoenix, AZ, USA. This building was a converted discount store, located seven miles south of the main Honeywell LISD plant at Thunderbird Rd. & Black Canyon Freeway, "Deer Valley Computer Park" (DVCP). System M moved to DVCP in 1987. .. plus other equipment for System MB, including a GCOS system that ran CUESTA (see below). New versions of system software were exposed here after they had been checked out at CISL and MIT. The System-M machine was also used for final packaging and tape generation for MR releases. System MB was the part of System M that was used for benchmark support. CPUs and other resources could be switched from one machine to the other, allowing benchmark development while service was running, and then making a big configuration for actual benchmark runs. The Phoenix Multics development group played a major role in supporting System M, since it was an internal development site. Frank Martinson managed the group that kept System M going. Lacy Johnson was the main system administrator. The people who ran System M included Conrad Barriga, Gerald Cahoon, Willie Drumm, Kay Kaiser, and Harold Van Sant. MRDS, the first commercial relational database product, was developed at System M by Jim Weeldreyer and Oris Friesen. [PWB] CUESTA was the load generation software. It ran on a GCOS 3 machine at Camelback. I worked for Honeywell FSO (Federal Systems Operations) in the 77-79 timeframe doing GCOS and later Multics benchmarks, the most significant of which was the EOP (Executive Office of the President) benchmark. The EOP benchmark had a lot of word processing in it. I entered a TR about compose performance. A response from the developer of compose, Ed Wallman, likened using compose to do the tasks in the benchmark to using a 747 to retrace the first flight of the Wright Brothers. A followup mail from Ed's manager, Tom Van Vleck, suggested that a simple fill and adjust routine be written to do the job. I still have a copy of that email. One night on System MB (the benchmark system) I wrote that simple routine, and using it reduced the configuration that we ultimately bid by an entire CPU. A few months later I joined Multics development and one of my first tasks was to make that fill and adjust routine a product. It (format_document) was never widely used, but its subroutine interface (format_document_) was used by several Multics subsystems including the mail system and forum. [PWB] The RPV of the last instance of System-M was taken apart, its platters engraved and given as mementoes to the remaining Phoenix Multicians at (by then) Bull. I have one in my garage. [PWB] The CRF building has reverted to its original retail origins and is now "In-Door Swap Mart". 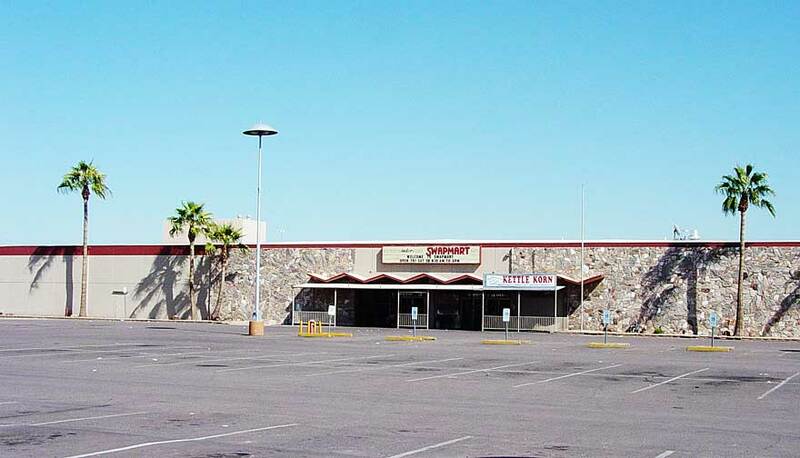 The former CRF building, with the Indoor Swap Mart sign on it. Photo by Anthony Nemmer, Sept 2003. Click for a larger view. [WOS, Nov 2002] I drove by the former Deer Valley Computer Park, and discovered that it has been converted (in part) into luxury apartments! The "new software building" still has a Bull sign, but the rest of the facility is long since re-used (there's a Fry's--grocery, I think--and some other mixed-use commercial, but the apartments were what really tickled me). 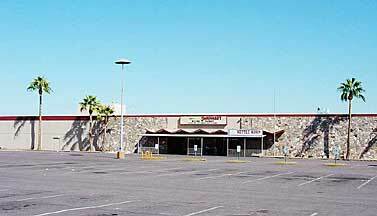 [PWB, Oct 2012] The CRF property, which has been home to the Indoor Swap Mart for several years, has been sold to Grand Canyon University, which itself is located about a mile west at 35th Avenue and Camelback.